We woke up at 6:30 on the floor of Porters Creek Hut, and tried to pack up quickly and quietly, doing all of our rustling in the entryway and outside. It was still cloudy and was drizzling slightly, but it didn’t look like it had rained an substantial amount overnight. 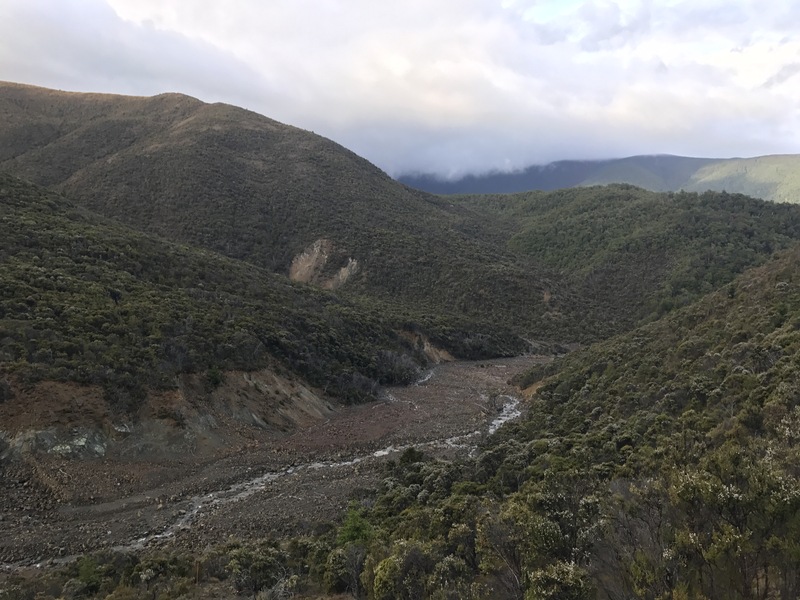 We were glad, as we were expecting big rain at some soon point, and we wanted to get across a river crossing about 5 km from the hut before it had time to rise at all. We left just after Kate and just before Jackson, two other thru-hikers. Setting off through the brush the drizzle gradually stopped, and we were glad to take our rain jackets off and hike in the cool wind. We went up and down (mostly gradually up) through rocky scrubland (the geologic makeup of the soil of this belt doesn’t support much vegetation, and is skewed in favor of minerals rich in iron and magnesium and low in silica – these minerals tend to weather red and brown, giving the region the name the ‘Red Hills’), down and up steep creek valleys and across barren hillsides covered only in small rubble pebbles making balance quite difficult and walking unnerving – this is what the kiwis call ‘sidling’. 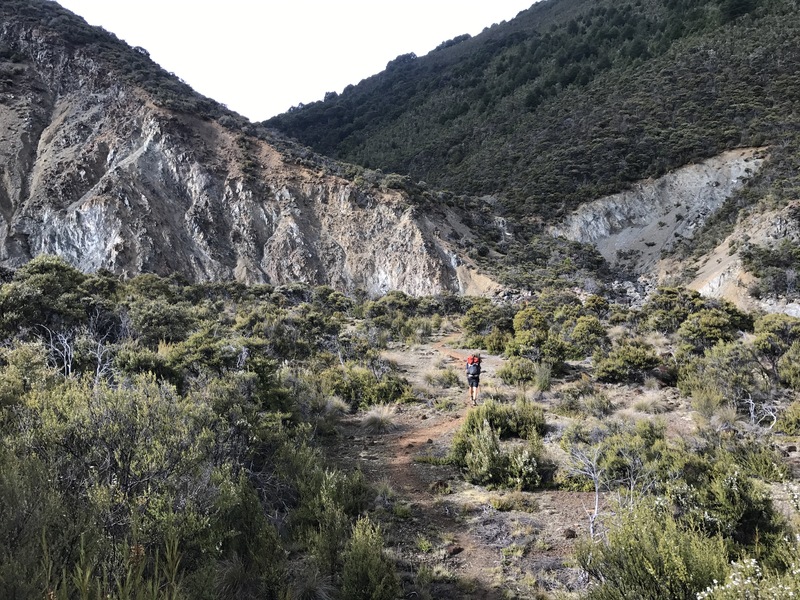 We eventually, after about 4 km, broke out overlooking the Motueka River valley, a steep but expansive and long valley, through which we could look down and see what we would have to cross in a little bit. It didn’t look bad and the rain still hadn’t started so we felt fine. Plus a rainbow had been following us for an hour or so, off to our right and very close. We made our way upriver along the side of the valley, on the true right bank of the river but quite distant from it still and about 100 meters up from it. 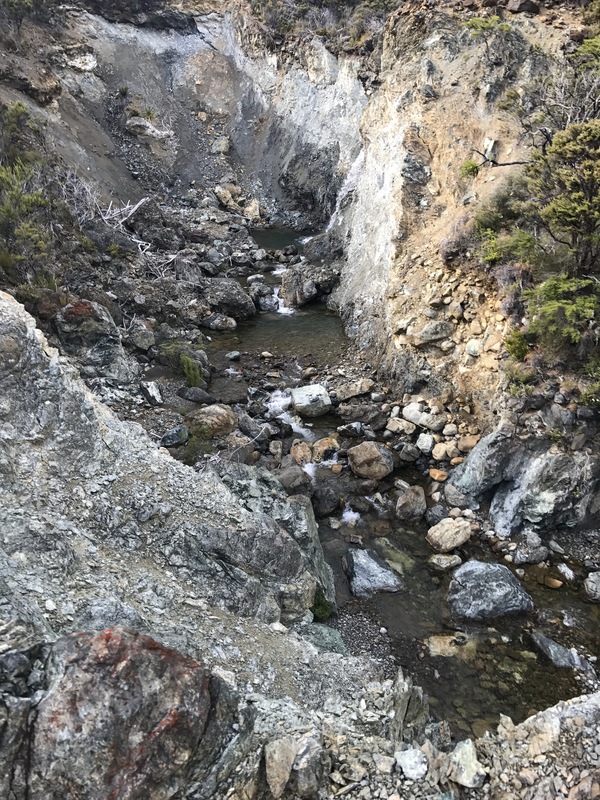 It was a mostly gentle slight descent to our crossing but punctuated by steep dips into and bouldery scrambles across creek valleys. Just after the final creek crossing, the small but fast Maitland Creek, we finally scrambled up and over a hill and down to the river itself. The crossing turned out to be totally fine and I think no one even got their feet wet, as it was easily boulder-hopped. As we sat on the opposite bank and considered eating all of our extra food on the spot, with our last obstacle behind us, Kate and Jackson both arrived and we guided them across the same route we had taken, fancying ourselves experts of this twenty-foot-across, inches-deep section of water. 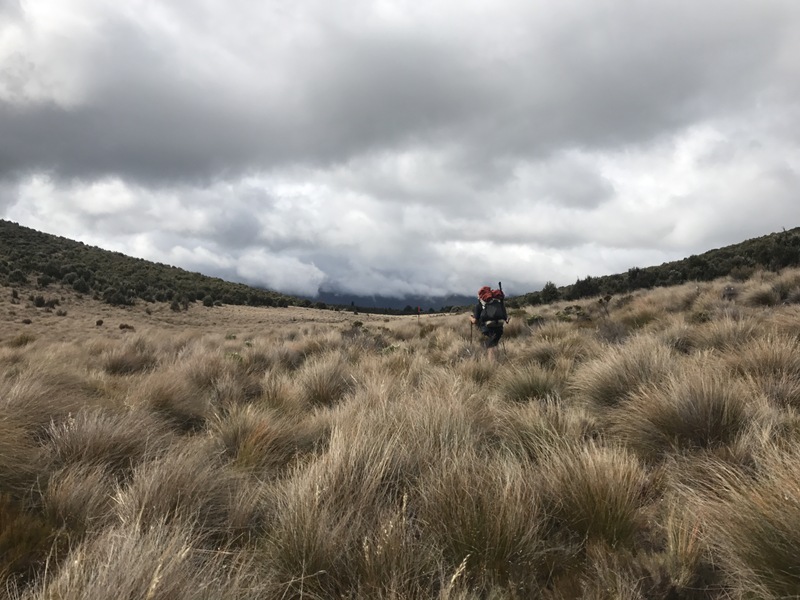 Regardless of its tameness we were glad to be across – if the rain that has happened by now had happened by then, things would be much different and we might be waiting behind it to be able to cross still. So feeling good and relaxed we completed the leg to Red Hills Hut, which went up steeply out of the valley, but then just ambled pretty flat but undulating, through more scrubland for 4 or so km, and eventually broke out into some open tussock (within view of the hut), which unfortunately was pretty saturated with swampy mud. Wet and muddy feet were unavoidable, and maybe the only such time so far on the South Island. Has been great in that way so far, surprisingly! We approached the hut just after Jackson and just before Kate, and with only 10.5 of easy 4wd track to the road, we took an hour and a half break, and cooked some hot lunch with our surplus of pasta. By the time we left, the two local kiwi guys, father and son, who had stayed in the hut as well last night, had reached this last hut and eaten lunch, and left a little bit before we did. 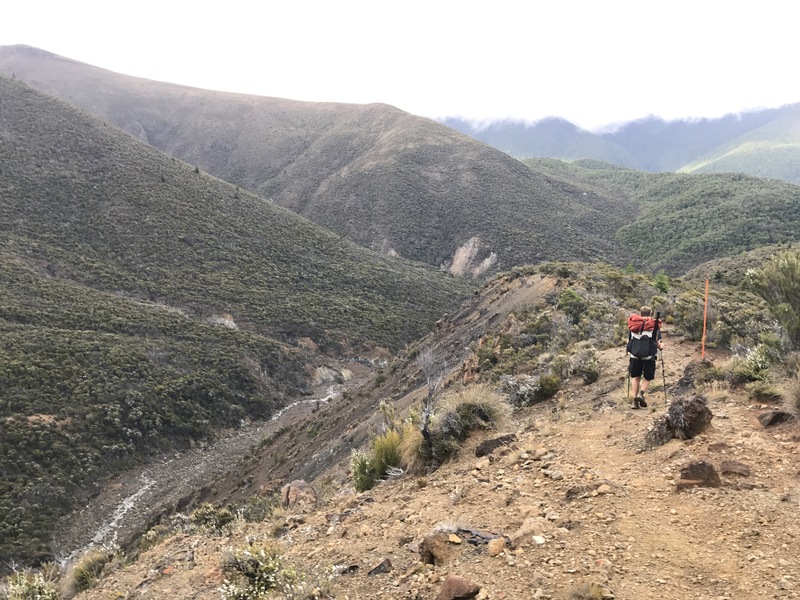 We passed them up on the way down, and heartily enjoyed the amazingly gradual descent through thickening forest with views down the huge and flat Wairau valley, over farms and highway, toward St. Arnaud, which lay out of sight up an adjoining valley about 10 km away. Just before the end of the track, it turned back into walking track and took us through the woods up and down some hills for about fifteen minutes before we were spat out at last into the carpark right by the highway. 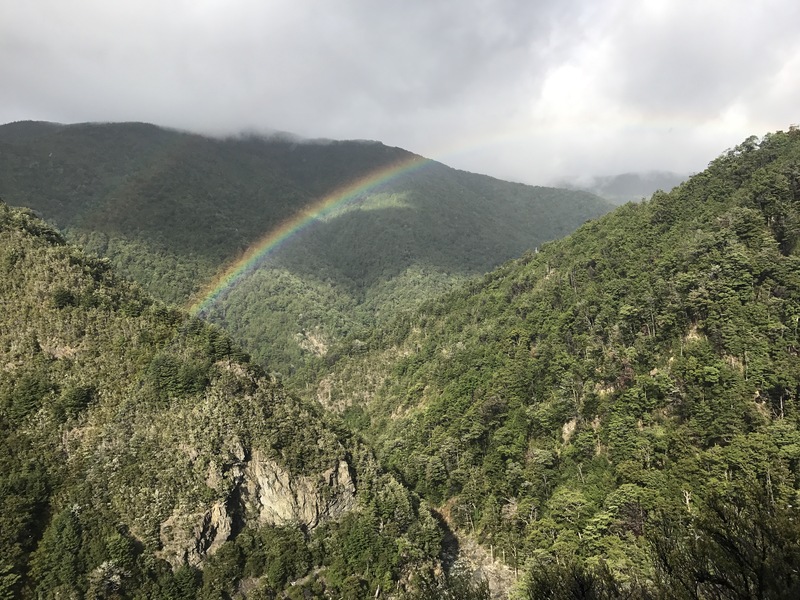 We split up and Jasper and Shep started walking up the road to St. Arnaud, while Jack and I hung back right at the entrance to the carpark, trying to hitch this highway section, and right then the rain really started coming down, so we were especially interested in getting a lift. Traffic was not the strongest, but apparently since the Kaikoura earthquake this stretch of road is replacing one of the larger highways in the region, which was blocked by landslides, so the traffic. was actually more than is typical here. After five minutes or so of standing, watching Shep and Jasper walk out of sight, a car pulled into the carpark, and about five minutes later it pulled out, driven by the wife and mother of the two kiwis, who she was picking up. Quite graciously, they stopped to let us in! As we drove the rain only intensified so we were so thankful to be zooming along in a warm car. They dropped us at the Alpine Lodge in town, where we are staying, and we got our room, showered and waited for Shep and Jasper. They weren’t much longer, maybe 45 minutes, but in that time had walked about 3 or 4 km in the rain before getting picked up so arrived quite soggy and glad to come inside the cozy room. We passed some hikers on the way who either were not trying to get picked up or had had to walk the whole way – either way good on them! By this time it was mid-afternoon, so we just relaxed for a couple hours and dried out, got some snacks from the general store across the street, and eventually had dinner downstairs. We are going to bed pretty immediately after dinner, because we are tuckered out from the intense but gratifying Richmond Range section! Excited for a rest day tomorrow and possibly for more time if the weather stays bad. Next Next post: Day 81 – St. Arnaud Zero Day!